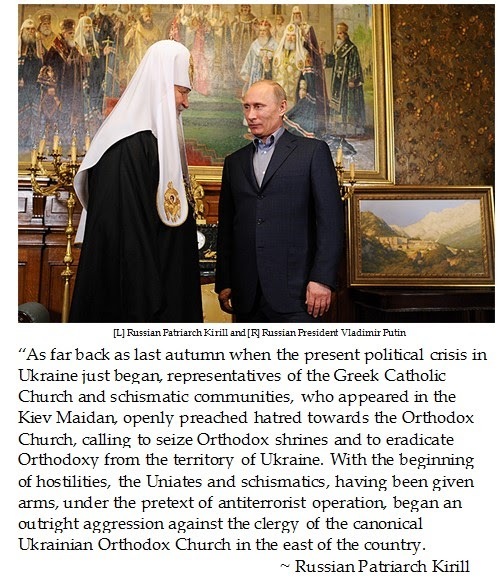 Russian Orthodox Patriarch Kirill I (ne Vladimir Mikhailovich Gundyayev) made some bold, nationalistic statements which seem to affirm Russian President Vladimir Putin's stealth war in Eastern Ukraine relying upon GRU kinetic operations in the Donbass region. But before you take the Russian Orthodox's philippic as gospel, there are a few things to consider. The Uniates are Eastern rite Catholics (whose worship is quite similar to the Orthodox except they are loyal to the Pope) is only the majority in three Western Ukrainian Oblasts. Of the 75% of Ukrainians who believe in God, just over 5% are "Greek Catholics". Patriarch Kirill referred to the Euromaidan (which he called the Kiev Maidan), in which he alleges that the some of the Uniate demonstrators denounced from the dais Orthodox and called for the eradication of Orthodoxy in Ukraine. Really? The Euromaidan hosted HOURLY ecumenical prayers for the several months that protesters made their stand at the Maidan in the freezing cold. It seems rather implausible that an extreme minority faith working in an ecumenical environment for positive change would agitate for eradicating Orthodoxy from Ukraine. This sounds more like Russian Intelligence Disinformation which preys upon long standing schisms of Christianity rather than the facts on the ground in the Donboss. The Ukrainain Greek-Catholic Church has appealed throughout all the months of the violent uprisings for searching ways of peacefully regulating this. Simultaneously, it does not contradict the right and obligation of Ukrainian citizens to protect their freedom and independence. Together with representatives of other Churches and religious organizations, UGCC is making concrete efforts to provide humanitarian assistance to the victims-residents of the Eastern regions of Ukraine, regardless of their nationality or religious affiliation. We categorically condemn any violence towards the peaceful residents of Ukraine, especially its clergy, regardless of the fact to which confession, religious or ethnic group they may belong. Once again, we remind all of the appeal of the All-Ukrainian Council of Churches and Religious Organizations for an immediate end of the violence and the surrender of arms by all illegally armed contingents, whose evil deeds have taken the lives of hundreds of Ukrainian soldiers, law enforcement personnel, and civilians, including women and children. Attempts to claim that during the Anti-Terrorist Operation (ATO) the Orthodox faithful of the Moscow Patriarchate are the only ones who suffer, is a dangerous intention to set off the whole Ukrainian society against one confession. Intolerable is the evil attempt to label the realization of the natural right of the Ukrainian people for freedom and independence of their country, into the inter-confessional area, which provokes new tensions and new sadness in Ukrainian society – this time in the activities of inter-confessional relations. Today Ukraine needs from its church men not a provocation of violence, but a construction of peace. Ukrainian armed forces are not structured according to confessions. Therefore, in the area of ATO activities, there are chaplains of various confessions. After the fall of the Western Roman Empire occurred in the 5th Century A.D., Eastern Christendom was ecclesiastically governed by autocelaphous bishops (where a head bishop does not report to higher ecclesial authority) in regions. Unfortunately, autocelaphaly can caesaropapism (combining the power of secular government with the religious power, or making it superior to the spiritual authority of the Church). It is shameful that at a time when Christians in the Middle East (Copts, Orthodox and Catholic) are being martyred by organized Islamist jihadists, that Christian leaders are jockeying for supremacy in ways which parallel secular Russian Federation expansionism.